Welcome to our yard, gardens and deck! We have built and planted all these years with the best helpers of all.....our little gardenyardigans! We have watched our GRANDKIDS blossom and grow along with the beautiful outdoors! Each child has been an important part of making this house a home. The yard work......building the deck and the wall, planting, watering and weeding. The yard art.....from the frog collection and rock garden from my Mom and Dad, the nautical touches from living on lakes and oceans to my collection of decorative birdhouses. But it wouldn't be HOME without the squeals, laughter and delight that has filled our yard with love and joy! They have planted flowers and a veggie patch, built and painted birdhouses, "watered" the lawn by running through the sprinkler! They have used binoculars to hunt for bunnies and squirrels, magnifying glasses to look for crawling, creeping creatures and used their creativity and imaginations playing in the huge sandbox. Thank you my Sunshine and Flower for showing us the way. And thank you to my Shining Star and the Dynamic Duo for keeping us going! 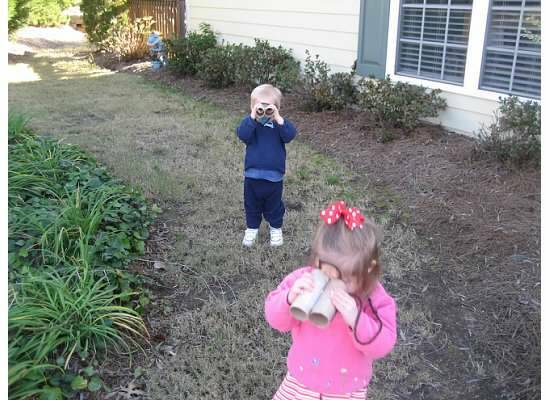 You do have a wonderful backyard -- but then you have such good helpers! Is there anything more fun than kids and water? Amara would love helping them "water" the yard!